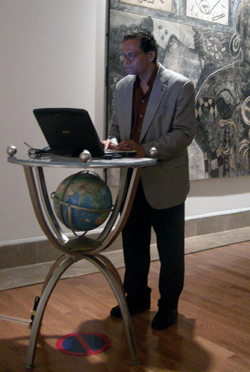 DIÓGENES BALLESTER, MFA is a visual artist, educator, and writer. Mr. Ballester works in different artistic media including painting, printmaking, drawing, new media, and installation art and is recognized as a master of encaustic painting and printmaking. He has received numerous honors for his artistic work and has exhibited widely in the United States, Europe, Asia, Latin America and the Caribbean. Diogenes' Studio was founded in1987 in El Barrio (Spanish Harlem) of New York City and has been in continuous operation for 24 years. Mr. Ballester produces/creates paintings, prints, drawings, new media and installation art. He is especially known for his mastery in encaustic paintings, an ancient painting technique that produces rich colors and thick impasto. He has produced artworks in New York City since 1981 and is a well-recognized Puerto Rican artist in Puerto Rico, the Caribbean, and the Puerto Rican community of New York.